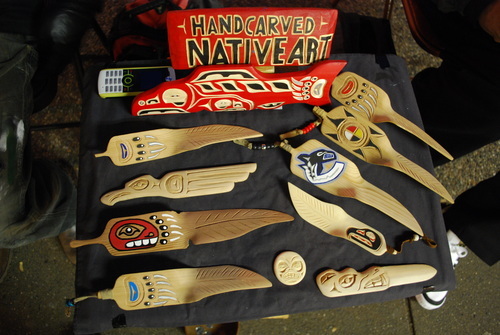 First Nations native art Street Carver. Dennis Rose - (604) 719-1325 of the Anishinabeg (Ojibway) Nation. Call Dennis direct on his phone to order a carving or two for a gift. Meet him on Robson street between Thurlow and Burrard or down in Gastown by the Steam clock and barter with him. 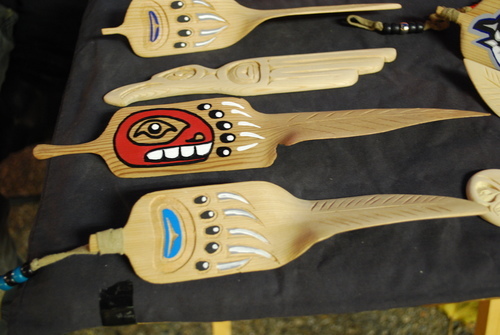 Along with Dennis Rose are Chris Turo (Dene), Alex Mountain (Kwakiutl), Richard Mountain (Kwakiutl), and Andrew Mellish (Kwakiutl) are a few of the long time Street Carvers you will see and meet. 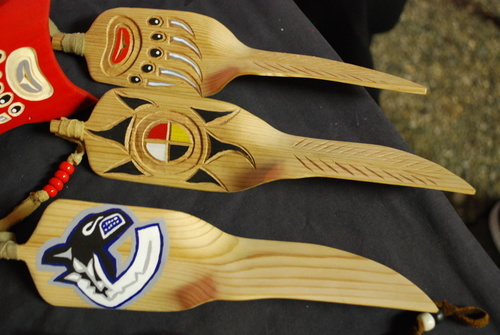 Hand carved wooden feathers with crest and story designs. 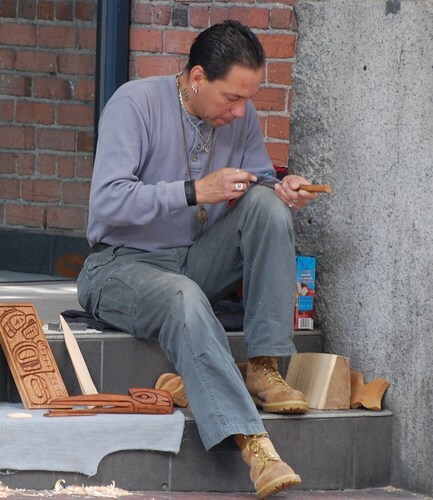 Meet him on Robson street between Thurlow and Burrard or down in Gastown by the Steam clock and barter with him or another native brother-in-carving. 4th left-Bear track on feather. 2nd right- Dene 4 directions design on twisted feather,Chris Turo. 3rd right- Canuck design on twisted feather, Chris Turo. bottom right- Wolf head handle letter opener by Dennis Rose. Top - Wolf track on Eagle feather carved from yellow cedar. Second - Thrush carved by Dennis in yellow cedar. Third - Bear head/track and Eagle feather carved in red cedar. Bottom - Bear track on Eagle feather in yellow cedar. Meet him on Robson street between Thurlow and Burrard or down in Gastown by the Steam clock and barter with him or another native carver. 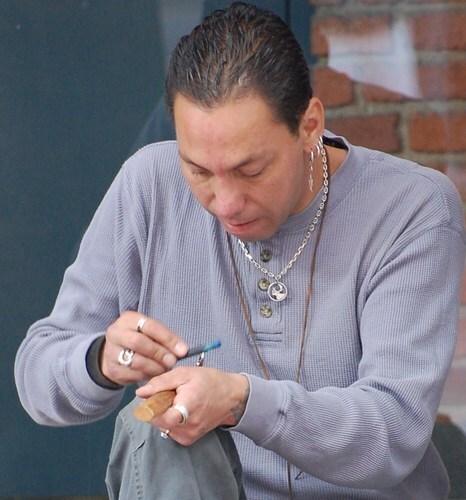 Along with Dennis Rose are Chris Turo (Dene), Alex Mountain (Kwakiutl), Richard Mountain (Kwakiutl), and Andrew Mellish (Kwakiutl) are a few of the long time Street Carvers you will see and meet. Top - Bear track on Eagle feather in yellow cedar. Middle - Dene 4 directions design on Eagle feather in cedar. Bottom - Canucks Killer Whale on Eagle feather, by Chris Turo in cedar.